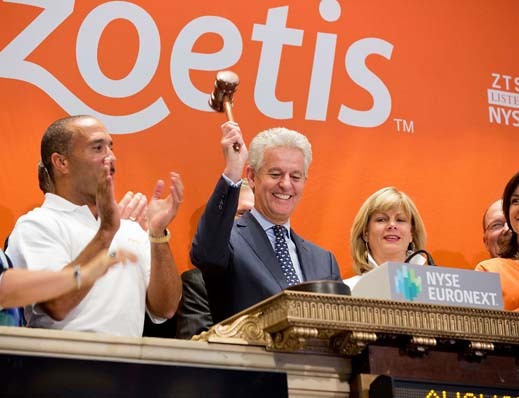 CEO Juan Ramón Alaix rings the opening bell on the floor of the New York Stock Exchange in celebration of Zoetis’s IPO. Life in a new city is difficult, especially if you root for its rival. Juan Ramón Alaix should know. He moved from Barcelona to Madrid at age 10 but couldn’t bring himself to support Real Madrid Club de Fútbol when his heart was with Fútbol Club Barcelona. The two foes battle on the pitch in matches known as El Clásico. Their rivalry has become one of the fiercest in global professional sports. Alaix graduated from university and started working in Spain when a position at Rhone-Poulenc as the international company’s general manager took him to Belgium in 1996. He discovered relocating was easier the second time around. “After you’ve lived and worked in a place that’s new to you, it’s not as overwhelming to do it again,” Alaix says. He returned to Spain to serve as president of Pharmacia’s operations. When Pfizer acquired Pharmacia in 2003, the company asked Alaix to relocate to the United States and assume a regional role for his new company. The move was more than a physical one, as Alaix found himself with a host of new professional responsibilities that he would have to master, while adjusting to a new company, a new culture, and a new language. He went from managing work in Spain to managing all regional business functions for parts of Europe from the United States. 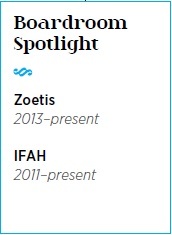 In 2012, Pfizer decided to separate Zoetis, once known as Pfizer Animal Health, into an independent company. The move, completed in June of 2013 after a successful IPO, formed a fully independent company. With 9,300 employees worldwide and products and services sold in 120 markets, Zoetis is the largest animal-health company in the world. It performs research and provides veterinary medicines, vaccines, and other animal-related services. Zoetis generated $4.3 billion in yearly revenues in 2012 through a three-tiered model. First, the company interacts directly with customers, developing strong relationships through the industry’s premier sales force. Second, it continues to innovate with new products across eight species of animals and in five therapeutic areas. Lastly, Zoetis provides the most reliable, high-quality manufacturing supply in the industry. Today, Alaix says one of his most important functions is to guide the company through its post-Pfizer era by creating a new corporate DNA and company culture. That process begins in the corporate boardroom. Zoetis’s board was formed by appointing three independent members and five members from parent Pfizer. Then, when Pfizer divested its remaining stake in Zoetis, three new board members replaced the Pfizer executives. One leader from Pfizer stayed, and other positions may still be filled. Alaix and other members worked together through a comprehensive interview process to find candidates from various industries and backgrounds. “We wanted to locate people with expertise in business and finance, as well as someone who brings science and experience in animal health,” Alaix says. “We wanted diversity and looked for people with a good combination of experience and expertise.” Forming the initial board was especially important, because Alaix and his partners were establishing the foundation of Zoetis. Together, the board and company executives are helping Zoetis find its way apart from Pfizer. “Pfizer has their unique needs and we have ours,” Alaix says. “We serve different species, different needs, and different customers. A lot of what we do should be different.” The company aspires for its people and products to be the most valued by animal-health customers around the world and is establishing a strong foundation by meeting its financial commitments and working to communicate its new identity. With that important work underway, Alaix can focus on what he does best—leading. He likes to arrive at his New Jersey office before the clock strikes seven. The habit allows him to avoid traffic and review the previous day’s business before starting on new projects. He also uses the hour to make phone calls to Zoetis’s offices in Europe in Asia, where the time difference is between 6 and 12 hours. Staying connected to its operations in 70 countries outside of the United States is important, and Alaix says he spends 35 percent of his time travelling. You need to work hard no matter who you are or what position you hold. Embrace change and see every new task, position, or project as a chance to grow. Alaix is a past president and current board member of the International Federation for Animal Health (IFAH). He serves on the executive committee to help the group promote and communicate the value that animal health companies bring to society. He says IFAH looks to support innovation, navigate regulations, and interact in public policy issues. While many leaders in corporate America see major obstacles for Latinos in business, Alaix says his global perspective and personal experiences give him a different perspective. “I don’t see restrictions in this country, I see opportunities,” he says. “If you show education, experience, and ambition, then you are well positioned for success.” Zoetis, for example, has a C-suite filled by people from various geographies, including Colombia. Like the young boy who rooted for Fútbol Club Barcelona in the middle of Madrid, Alaix says aspiring professionals need to be flexible while retaining who they are. Horizontal movement can be important for professional development, adaptability is important, and global experience is crucial in the “shrinking” world of international business.